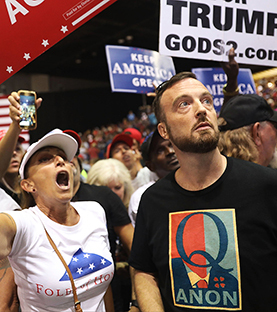 Once found mainly on society's fringes, conspiracy theories are increasingly infiltrating public discourse: The government manipulated the weather to cause a hurricane; gun control advocates staged a mass shooting; a “deep state” is plotting to ruin President Trump. Yet researchers say conspiracy theories are no more prevalent today than 100 years ago. What is new, they say, is that the internet, social media and mainstream media coverage are helping conspiracy theories spread faster than ever, sometimes with dangerous consequences. Many political scientists worry that the trend could undermine trust in government, incite violence or, at the very least, undercut faith in accepted facts about the nation and world. Trump has contributed to the problem, some contend, by professing belief in false conspiracies, such as that President Barack Obama was not a U.S. citizen. Mass shooting victims or their families, meanwhile, have accused conspiracy theorists of harassment and begun taking them to court. The lawsuits raise questions about whether conspiracy theories are protected speech under the First Amendment.